Adore Softphone for MAC, which has been specifically designed and developed so that it may work efficiently with the MAC operating system. 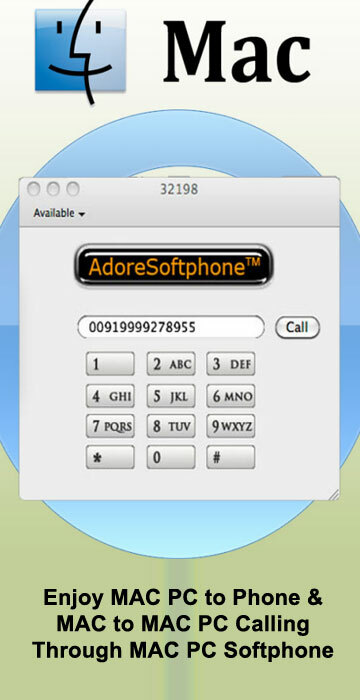 With the development of this VoIP Dialer software, Adore Softphone has carved a niche place in the world of application development and stepped a move ahead to provide quality and robustness to the PC, MAC and Mobile users, who want to enjoy an amazing calling experience. The VoIP Dialer software allows users to make effective and elegant MAC PC to Phone and MAC to MAC PC calling along with easy to use functionality and clear voice. Built on the SIP platform, it allows users to enjoy an outstanding IP telephony experience in a new, novel and unique way.